The world is shocked at the severity of the Ethiopian famine. But few realize even now how close to disaster the world outside Africa could be! FAMINE in East Africa burst into the headlines at the end of 1984. Televised news accounts of the suffering of hundreds of thousands of starving Ethiopian peasants triggered the launch of an unprecedented international famine relief effort. But the news reports barely scratched the surface in explaining the problem in Africa as a whole. And practically no news source investigated the depth of the crisis in agriculture, not only in Third World countries but in the advanced nations that so often must come to their rescue. You, the reader of The Plain Truth, need to know what is happening. While the plight of Ethiopia has received the most attention, 30 other countries in Africa are affected by drought and famine to one degree or another. The grim fact is, there are two broad famine belts, one running just below the Sahara, spanning the continent from east to west, together with another band stretching along the east coast, from the Horn of Africa down almost to the tip of the continent. Together, the two regions have produced the worst famine in African history. An immediate cause of the multiple famines is, naturally, drought. But other more fundamental factors lie at the root of the crisis. First of all, there is widespread abuse of the land, specifically deforestation, overgrazing and improper cultivation techniques. Governmental misdirection plays an equally significant role. Throughout Africa since the days of political independence, agriculture has been sorely neglected, often in favor of ill — chosen industrial development. In addition, leaders coveting the political allegiance of the urban masses have found it expedient to clamp price controls on the rural food growers, which in turn discourages production. As a consequence, farmers have abandoned the fertile country-sides and joined the swollen ranks of I urban dwellers. The result is that most African nations, once self-sufficient in food production, have become net food importers. Wars and civil unrest — Ethiopia being the most publicized example — further disrupt the planting and harvesting of crops. Nations suffering most from the famine have for years been embroiled in civil war. It is no coincidence that in the march of end-time prophetic events "famines, pestilences" follow, in time sequence, after "nation will rise against nation, and kingdom against kingdom" (Matt. 24:7, Revised Authorized Version). Africa's food crises can only get steadily worse, even if immediate drought conditions are relieved. Nothing substantial is being done to eliminate the root causes in the social and economic fields. And warfare threatens to undo what could be done anyway. As a result, Africa's dependence on relief aid will probably grow in the year ahead. A study issued by the Swedish Red Cross and by Earthscan, a London-based environmental news service, reports that "events called 'natural disasters' are killing more and more people every year." Yet, these observers note, "there is no evidence that the climatological mechanisms associated with droughts, floods and cyclones are changing." Instead, the report says that behind such "trigger events" the answers must be found in "human vulnerability resulting from poverty... environmental degradation, owing to poor land use, and rapid population growth, especially among the poor." The May 1984 Swedish Red Cross survey zeroed in on the Ethiopian crisis — before it made the headlines (and before the Ethiopian government finally admitted the extent of the disaster). "The worst 'drought — affected' farmland in the Gondar Region has only bare rocks left. Most soil, including all topsoil, is already gone. This land has indeed 'reached quite an irreversible condition,' to quote the Ministry of Agriculture." Ethiopia's denuded countryside simply can no longer sustain the nation's 35 million people, 90 percent of whom are still farmers. The land is also seriously overgrazed, unable to support its 77 million head of livestock — Africa's largest stock of domestic animals. The result, as summed up in the Swedish Red Cross survey: "Since World War II the country has gone from being a net exporter of cereals, to self-sufficiency, to having a cereal deficit. The per capita production is falling by almost two per cent each year, making the country more and more dependent on imports and outside assistance." Throughout other parts of Africa the ravaging effects of deforestation and resultant erosion are painfully evident. The author recalls visiting a small newly independent nation in southern Africa a few years ago. It was during a rainstorm. The countryside was devoid of trees. Rainwater cascaded through enormous gullies gouged into the hillsides into a muddy, swollen river. I visited the young Minister of Agriculture and told him he had an enormous task ahead of him in reversing the conditions I had just witnessed. Another grim statistic to bear in mind when examining Africa's long-term crisis is this: At least 20 percent of the continent is desert. Worse yet is the belief by experts that the process of "desertification" could envelop 45 percent of Africa 50 years from now, if current land-use trends continue. After Africa, the Indian subcontinent may be the next region to experience a severe food crisis. 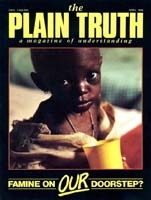 Eighteen years ago, Indians stared at famine. For weeks, an endless procession of freighters and tankers converted to grain haulage sailed from the United States to India. This oceanic pipeline rescued the Indian people from starvation. The crisis of 1967 abated. Since then, the life-giving monsoons have generally been good. New "wonder grains" produced as a result of the Green Revolution — more about that later — have enabled India to build up nationwide grain surpluses. But now, India, especially in its southern states, is in the throes of a new drought. Nalni Jayal, adviser to India's Planning Commission, said at the general assembly of the International Union for the Conservation of Nature and Natural Resources: "We are on the verge of an enormous ecological disaster. What is happening in Africa is going to happen in India within ten years." Mr. Jayal believes the primary reason for the crisis is the felling of forests. "Wherever the forests have been left intact there is water," he told the conference. "Wherever they have been cut down there is a crisis." Other experts estimate that 60 percent of India's cropland is eroding excessively. The looming crisis in India is also compounded by worsening social conditions. What would happen to India's food supplies in the event of anticipated turmoil over an independent Sikh "Khalistan" in the agriculturally rich Punjab? The farmers in the Punjab — the state is called India's Iowa — produce 60 percent of all the food in India, including 90 percent of the nation's wheat! As the Ethiopian crisis again proved, Western nations — specifically the United States, Britain and the European Community (whose reserves are largely the result of artificially high price supports paid to farmers) — made the difference between life and death for millions of Ethiopians. The emergency relief effort, however, only masks Africa's day in and day out dependence upon foreign food sources. "Although an agrarian continent," reported Lester R. Brown and Edward Wolf in the June 1984 issue of Natural History, "Africa is slowly losing the capacity to feed itself. Between 1970 and 1983, net grain imports quadrupled, climbing from five million to twenty million tons. Grain from –abroad now feeds about one-fourth of the continent's 513 million people, and all indications are that imports will climb still higher in 1984." Simply put: too few are feeding too many. Much of the world's population is precariously dependent upon a shrinking number of food (principally grain) exporter nations such as the United States, Canada, Australia, New Zealand, South Africa, Argentina and Thailand (and this year, China also became a net grain exporter). More than 100 nations depend to one degree or another upon just one producer — the United States — for grain supplies! Should drought seriously impact any of the major exporters for any length of time, the lives of millions of people in the Third World would be imperiled. Exports to food — short regions are placing additional strains on agriculture in the developed countries. One of the effects is accelerating erosion, a consequence of encouragement given to farmers to plant their fields from "fence row to fence row." Erosion is developing into a serious crisis, in American agriculture in particular. "America is washing out and blowing away," warns Senator William L. Armstrong of Colorado. Roger W. Jepsen of Iowa, formerly the chairman of the Soil and Water Conservation subcommittee, explains that unless policy changes are made, "in some areas we won't have any topsoil left to conserve." Mr. Jepsen said that after years of heavy erosion of Iowa's rich cornfields, "where we had 8 to 12 inches, right now I can show you places with a quarter inch of topsoil left." Norman Berg, former head of the USDA's Soil Conservation Service, now an adviser to the private American Farmland Trust, is equally concerned. He says: "It is an urgent situation when one-third of our really good cropland is suffering net soil loss, with some soil eroding at twice or three or even 10 times the tolerable limit [of five tons per acre per year]." Experts trace part of the problem to often contradictory governmental policies that, while encouraging soil conservation, also encourage overproduction through price — support programs. The government often unwittingly pays for the idling of good farmland while simultaneously paying farmers to "sodbust" low quality, highly erosive land. Other experts are alarmed at the falling into disuse of erosion-control practices, such as tree windbreaks and terraces, which helped break the back of the infamous Dust Bowl of the 1930s. Windbreaks are too often viewed as obstacles which hinder the larger tractors and other implements used today. "We are losing farmland productivity at startling rates — rates that will bring us to the limit of our supply of good land sometime before 2000. At the same time, farm debt loads are soaring, bankruptcies are on the rise, and the spectre of a complete economic collapse in the farm sector is being raised in many quarters.... "
Modern agribusiness, as everyone realizes, is critically dependent upon a good economy and the steady, uninterrupted access to fossil fuels (for energy, fertilizer and transport to market), electricity and abundant water. Never has the food production supply chain — to a largely urban population — been more vulnerable to disruption. In the long run far more serious than erosion to the basis of modern agriculture is the shrinking genetic base of most major crops — and even livestock. Dr. Major M. Goodman, a statistical geneticist at North Carolina State University, states that "if this process continues unabated, we place man's future in jeopardy." The end result, he says, could be "genetic wipeout." Extinction of hundreds of grain varieties and the loss of their inherited traits has made future crop failures certain. One has only to look to the devastation wrought by the 1970 southern corn leaf blight to see such an effect. This epidemic wiped out 20 percent of the U.S. corn crop (which also amounted to 15 percent of the world supply). The fact that the blight did not start in the heart of the corn belt saved the crop from disaster, since virtually the entire corn crop was vulnerable. Nearly all the corn grown in the United States is based on three genetic varieties, or races, Dr. Goodman emphasizes. Yet there are 250 known varieties in the world. Americans once again, in 1984, saw the vulnerability of major crops with the outbreak of citrus canker in the Florida orange groves. Genetic diversity, explains another NCSU professor, Dr. Gene Namkoong, is nature's barrier against crop epidemics. But because crops of uniform size, shape, color and texture are more efficient to process in modern agribusiness, more uniform crops are being produced worldwide. In addition, crops producing higher yields are in much demand. "At one time, crop rotation formed geographical barriers to crop epidemics, but in modern agribusiness, single crops are grown in dense fields stretching across entire states. There's nothing to stop disease from spreading." Plant geneticists, according to Professor Namkoong, are "running to stay in the same place," in order to develop new disease — resistant varieties of major crops. To keep a step ahead of the pest and disease threats, researchers must have access to so-called primitive varieties, usually located in Third World nations. These local cultivars are necessary to maintain the inventories of national "seed banks" such as the one maintained by the U.S. Department of Agriculture in Fort Collins , Colorado. Americans might be shocked to learn that not one major food or fiber plant presently grown in the United States is native to its soil! "This germ plasm pool is dwindling in the United States and abroad. In America, the economics of modern agriculture have forced out the subsistence farmer who once relied upon breeds of plants and animals that were local in origin and adaptation. These have been replaced by the widespread monocultures of the big-business agriculturalist. "At the same time, export of the American-financed 'green revolution,' with its phenomenally productive rice , wheat and corn hybrids, has decreased the use of local species by farmers around the world-driving to extinction thousands of the parent stock of modern agriculture." It is not necessary merely to maintain native varieties in seed banks but to have continued access to them in the wild. In their native habitats, the wild varieties constantly adjust to the threats placed upon them, in a state of dynamic relationship to the natural environment. For this reason, plant researchers are especially wary of political disruptions in the largely Third World nations that are the source of so much of their native stocks. Ironically, Ethiopia has long been a major source of genetic diversity for many temperate zone crops. For example, an Ethiopian strain protects California barley from the devastating yellow dwarf disease. Not long ago the Ethiopian government stopped the export of germ plasm in any form or variety. Experts predict that Third World countries, who often complain of having to pay stiff prices for new varieties developed in the West based upon their old germ stocks, will be demanding more control over their genetic resources, much as Arab states have done since 1974 over oil. Nearly everywhere, the shrinking gene pool is causing concern. Not only grains, but vegetables such as green beans and canning peas now rest on a very narrow genetic base. According to Dr. Erna Bennett, formerly of the Food and Agriculture Organization in Rome, all major crops in Europe depend upon five to 10 varieties. Dr. Bennett told the The Plain Truth in 1973 that unless genetic deterioration is arrested, humanity faces the prospect of "continent — wide famines" in the not-too-distant future! Scientists believe they have a solution to the shrinking gene pool crisis: gene splicing, or "recombinant DNA." This involves the splicing of disease-resistant strains from one variety onto another, possibly even across species barriers. But experts predict it will be many years before major practical impacts will be experienced in agriculture. In the meantime, more valuable genetic resources will vanish. The fact is, gene splicing is another attempt to treat the effect, not the cause, of the worldwide breakdown in natural, traditional methods in agriculture. Worldwide plant epidemics are coming. As Professor Namkoong predicted: "Once you lose your genetic base, you can't recapture it. Major famines are inevitable, even with zero population growth, within 50 years." What is so evident today in East Africa is destined to become a worldwide phenomenon before the "end of the age" of human misrule.